The patriarch of a veritable cartographic dynasty, Claes Janszoon Visscher was one of the most prominent and celebrated cartographers of early 17th-century Amsterdam. 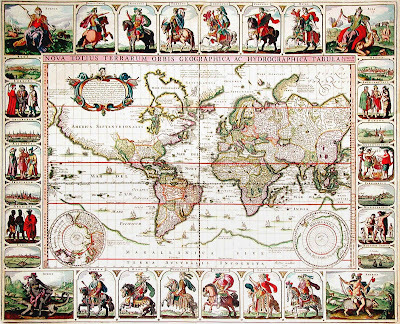 For geographical accuracy, clarity and skill of engraving, richness of detail, and artistic decoration, his maps were unsurpassed by any of his contemporaries. This striking map is an exceptionally rare and beautiful world map by this important figure, all the more notable for being adorned with gold leaf, a sumptuous material that was only rarely employed in the decoration of maps. Following early success with his great world maps of 1614 and 1617, Visscher became known for his fine regional maps, usually with splendid figurative borders. 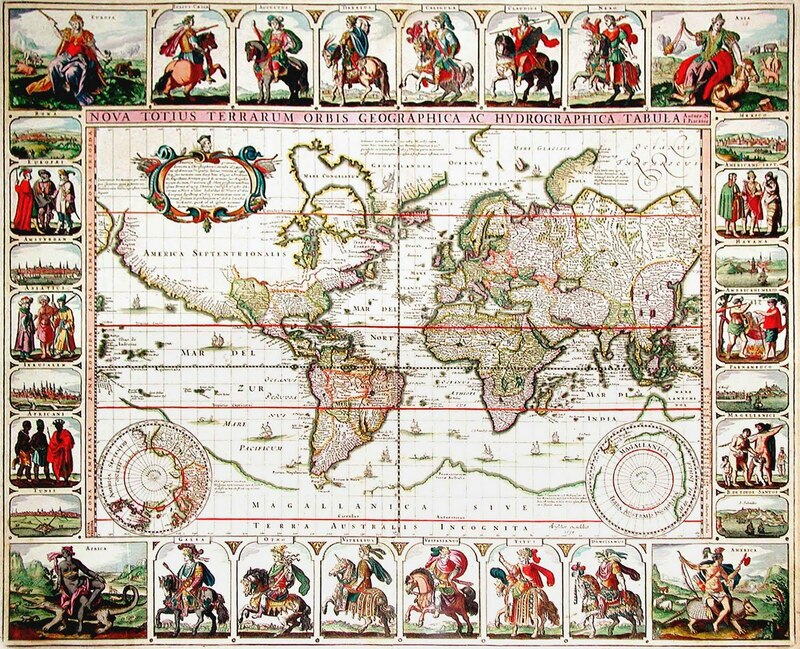 In general, maps of this period were elaborately and imaginatively embellished and colored. Because cartographers typically had access to the same geographical information, they were often left to compete in terms of aesthetics rather than accuracy, and Visscher's artistic talents were instrumental in his success. As was the fashion among the learned elite of the time, he often used the Latin version of his name, signing his works "N. I. Piscator" ("Piscator" meaning fisherman), as on this superb world map of 1639 (shown here in the state of 1652). This map followed a double-hemispheric world map Visscher had published the previous year, and was updated geographically to show discoveries around Hudson's Bay, and a longer St. Lawrence River. The magnificently decorated border is a prime example of Visscher's acclaimed artistic inventiveness, and includes twelve Roman emperors on richly caparisoned horses, six panels of groups of national figures, and six vignettes of the principal towns. In the corners are scenes depicting the four continents, with the personages representing Asia, Africa and America seated astride a camel, a crocodile, and an armadillo respectively. The coloring, which was applied by hand, is unusually rich and deeply saturated. After Visscher's death, his son Nicolas perpetuated the development of the Visscher publishing house into one of the most distinguished of all 17th-century cartographic firms -- a major proponent in the era now considered the Golden Age of Dutch Mapmaking. In the late 1600s, a period of great geographical discovery, Amsterdam was the international center of cartography. A number of venerable firms, including those established by Blaeu, Jansson, and Hondius competed for the ever-expanding market for maps and atlases. Despite the intense competition, with maps such as this one Claes Janszoon Visscher set standards for exceptional quality that few other firms were able to equal. Boasting advanced geographical information, fine engraving and coloring, and striking decoration, Visscher's maps are fundamental illustrations of the reasons for Dutch supremacy in mapmaking during the 17th century.